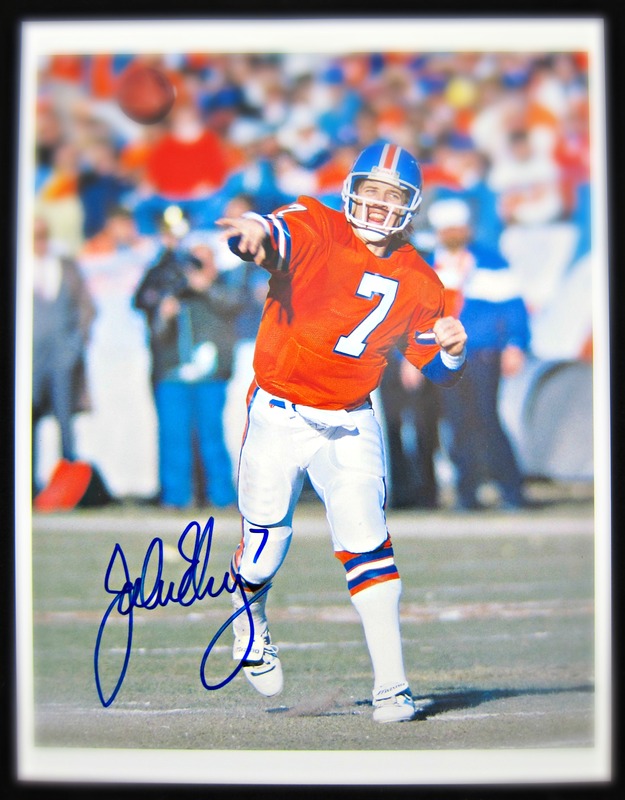 This 8″x 10″ color action photo comes signed by the Denver Broncos former quarterback and two time Super Bowl Champion, John Elway. It includes a letter of authenticity from Memorabilia Center. Elway set several career records for passing attempts and completions while at Stanford and also received All-American honors. He was the first selection in the 1983 NFL Draft, famously known as the quarterback class of 1983, where he was taken by the Baltimore Colts before being traded to the Denver Broncos. In January 1987, Elway embarked on one of the most notable performances in sports and in NFL history, helping engineer a 98-yard, game-tying touchdown drive in the AFC Championship Game against the Cleveland Browns. The moment is known in National Football League lore as “The Drive.” Following that game in Cleveland, Elway and the Broncos lost in Super Bowl XXI to the New York Giants. After two more Super Bowl losses, the Broncos entered a period of decline; however, that ended during the 1997 season, as Elway and Denver won their first Super Bowl title by defeating the Green Bay Packers 31–24 in Super Bowl XXXII. The Broncos repeated as champions the following season in Super Bowl XXXIII by defeating the Atlanta Falcons 34–19. Elway was voted MVP of that Super Bowl, which was the last game of his career, and in doing so Elway set a then-record five Super Bowl starts which was broken in February 2015 when Tom Brady of the New England Patriots started Super Bowl XLIX. As Denver’s quarterback, Elway led his teams to six AFC Championship Games and five Super Bowls, winning two. After his retirement as a player, he served as general manager and executive vice president of football operations of the Broncos, which won four division titles, two AFC Championships, and Super Bowl 50 during his tenure.